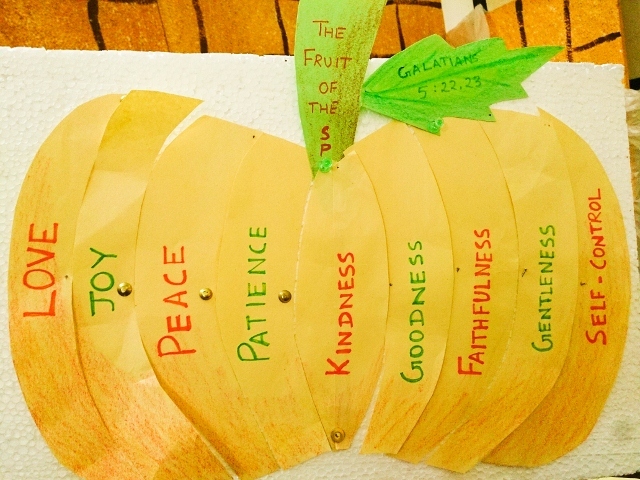 Here’s a play-way method to help kids memorize the fruit of the Spirit. You can check out the story for this session here. Objective: To make the kids memorize the fruit of the spirit. Draw a large fruit on the chart. Divide it into nine equal sections and write a name of the fruit of the Spirit in each part. Write ‘Fruit of the Spirit’ on the stem of the fruit. Cut the sections of the fruit separately. Teach the verse to the kids by making them repeat after you once or twice. Divide the class into nine groups. Hand out a piece of the fruit to each group. Call out a random name from the fruit of the Spirit. The pertaining group must stand up and sit. The group/ the team member who does not answer the call by standing up loses a chance to continue playing. In the final round get the part of the fruit from each team and stick/ pin it to the cloth/ cardboard/ thermocol sheet. At first jumble the names of the fruit when you call. This is just to make the kids get acquainted with the words.